The Oak Grove Baptist Church as we know it today was first organized as the Oak Grove Christian Church by the late Reverend Lake in 1925. The basis of our name was originated because of a large oak tree that stood in the church’s front yard. The initial membership began with approximately nine (9) dedicated members who were on one accord to serve the Lord. Reverend Lake served as pastor for three (3) years. Reverend Lake’s time as pastor was followed by Reverend Albright, Reverend Harper, Reverend Spencer, Reverend Carter, Reverend Baker, Reverend Singleton, Reverend Clarence Dortch, Reverend Augusta Miles, Reverend Kirby Murvin, Reverend William Lowery, and Reverend Paul Mosley. Under the leadership of our previous pastors, many organizations were formed which included a Missionary Circle #1, organized by Sister Tate, Sister Clara Alston, and Sister Mary Hill. Under Reverend Baker’s leadership, our first Deacon Board was organized. During the leadership of Reverend August J. Miles, the Trustee Board, Missionary Circle #2, Pastor’s Aide, Senior Ushers, Food Service Department, Senior Choir, Young Adult Choir, Junior Choir, Deaconess Board, and the Male Chorus were all organized. Sister Mary Hill served as the church’s very first devoted musician. In 1983, Reverend Kirby Murvin became our pastor and organized the Mother’s Board. Under his leadership we experienced a name change and became the Oak Grove Missionary Baptist Church. During this time, Sister Arletha Campbell served as the musician for Choir #1 (previously named the Senior Choir). In 1988, the first Sunday in April, Reverend William R. Lowery became the 11th pastor. Our church moved from its old location, 1300 Furlough Street to our present location, 1710 East Green Drive. Under the leadership of Reverend Lowery, the Nurses’ Aid, Evangelist in Action Program, Labor of Love Offering, First Lady’s Aide Board and the Extra Mile Offering was implemented. Several ministers were licensed under his leadership. In 2004, Reverend Paul Mosley became our 12th pastor. Under his leadership came the reach-out ministry, in-home ministry, birthday committee, praise team, and reorganization of the mass choir. In this short time, he also licensed two (2) ministers and ordained several deacons. In the year of 2010, Pastor Robert J. Tillman returned to our church and was installed as the 13th pastor after serving our church as interim pastor eight (8) years earlier. It is with great belief the Lord divinely orchestrated this spiritual reunion. 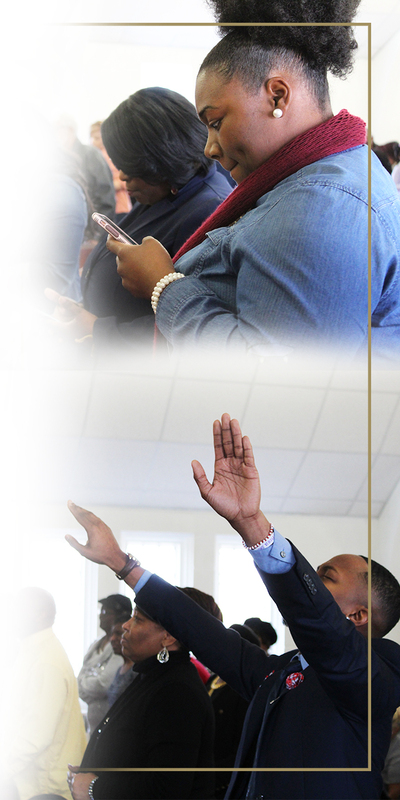 With God’s vision for our church burned in his heart, Pastor Tillman immediately began working to transform our church into a bible-based, well-rounded, exciting & thriving ministry that breaks the bonds of tradition and operates in total excellence while ministering to the total man (mind, body, & soul). This passionate work has already given birth to the men’s fellowship ministry, women’s fellowship ministry, conferences and empowerment sessions which has helped to make our church the place of renewed hope”.